This full tang katana has a carbon steel blade and a zinc alloy tsuba! Comparable swords cost much more than this. It measures 43.5 inches overall with a 28 inch blade. It comes with a purple cotton cord-wrapped handle. Click on the picture of the sword to show a detailed view of the hilt. Dragon designs adorn the wooden scabbard and guard. The 28 inch blade is made of 440 stainless steel. The sword's overall length is 37 inches. 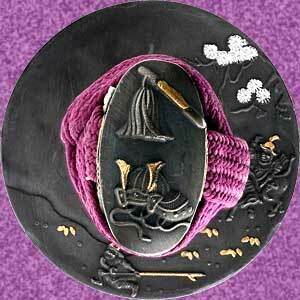 Long flowing dual tassels on the pommel accentuate the authenticity of this Chinese tai chi sword. 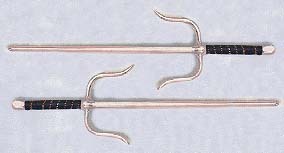 These sais are made of steel and have an eight faceted blade. The leather wrapped handles provide a firm grip. Each box includes 2 sais, so you get 2 sais for the low price of $29. Overall length 19.5 inches each.